Steven Pinker is, without doubt, one of the most important and knowledgeable intellectuals in the world today. With Enlightenment Now, he proves this point again. Few write as well as Pinker. And even fewer can pack so much information and statistics into a book and still maintain such beautiful prose. Even if you only remember a small part of all the knowledge you will acquire if you read this book, you will have learned a lot. The environment - Climate change IS a potential concern however we are making progress and in most other respects the environment is getting better: more trees, cleaner air etc. As we are entering the digital age we are also using fewer resources (paper, plastics etc). Violence - Murders, rapes, and violence are less common. It is very unlikely that you will die in a terror-attack. Happiness - People are happier today and happiness comes with progress in the other variables described here. Existential threats - The hole in the ozone is gone, forests are growing, no nukes have been launched (despite what doomsayers of yesterday would have you believe). To sum up the first part of the book: Things have gotten better. Much better. Still, don’t think that Pinker believes that all problems are gone. He reiterates the point that the laundry does not wash itself - and global challenges don’t solve themselves. Despite the progress we have seen there are ample challenges left. There are still wars, famines, genocides, and environmental issues. Pinker acknowledges this, however, he emphasizes that the world has seen progress, not regress. And it is important to acknowledge that things have gotten better - not to pad ourselves on the shoulder - but rather so that we can analyze what it is that has worked so that we can keep doing that. Is it the enlightenment ideas that have caused the undeniable progress in the world? This is the question addressed in the second part of the book. Since progress occurred in the world before the enlightened philosophers took the stage I would say only partly. Then again there were people acting in the spirit of the enlightenment even before Hume, Voltaire and the rest. And it feels safe to say that progress is not achieved through irrationality, populism, and closed-mindedness. To me as a scientist, this seems like a relatively trivial point, but I get reminded that it isn’t a view shared by the rest of the world every time I turn on the TV or radio. The objections to this book are predictable (see other reviews). People are accusing Pinker of being a politically motivated naive optimist. If you think so then I can only advice you to read the book (and finish it), and then make up your own mind. Unlike most of those who criticise him, Pinker provides data to back his claims. I can only assume that it is Pinker’s critics, not Pinker himself, who are politically motivated “progressophobics” who, upon hearing a couple of anecdotes or reading about the war in Syria, throws all data out the window and claim that things are getting worse and that anyone who says otherwise is a naive optimist, right-wing fundamentalist or climate change denier. This book is another masterpiece from one of the best non-fiction writers, and on my rating scale it no doubt deserves the top rating. However, I still think that Better Angels, with its more narrow focus, is probably a better book. To some extent, this book is a follow up to Better Angels, even though this book has a broader scope. Since Better Angels was published many people seem to think that things have turned around and that the world is now regressing. If you read this book you will learn that this is not the case. The progress until 2011 when Better Angels were published has continued and is expected to continue into the future as well. So, to sum up, read this book if you want an antidote to all the doomsayers that dominate the media. Read this book if you want to revive the optimist in you. Evidently, we can make the world a better place - as we have done in the past. I'm a big Pinker fan. He's a brilliant speaker, writer, and is fantastic at being able to disseminate erudite concepts to the common man. He has well-earned his reputation. He can be persuasive, witty and reassuring when we feel we are doomed as a society. He gives statistics that are irrefutable and makes a wonderful case for the fact that we are evolving, not devolving, as a society/nation/world. However, his last 3 chapters or so are very disheartening. I am hardly a fan of Donald Trump. However, Pinker's hatred of Trump spews forth in many venomous diatribes against him. I agree with him as to why Trump is what he is, and why he has accumulated a mass of followers. But Pinker's obvious bias is a problem. It will alienate some of the people who need to hear his message the most. For that, I must downgrade an otherwise sterling book. Bill Gates may have cited it a his new favorite book, but this is not the reason why you should read it ;-)...Besides, his promotion was certainly counterproductive to entice those people who, alas, would most need to read this book : the flat-earthers, the conspiracy theorists, the misinformed,scapegoat-seeking, angry, resentful, or bigoted masses who vote for populist politicians peddling anti-science propaganda to promote their ideological agendas. 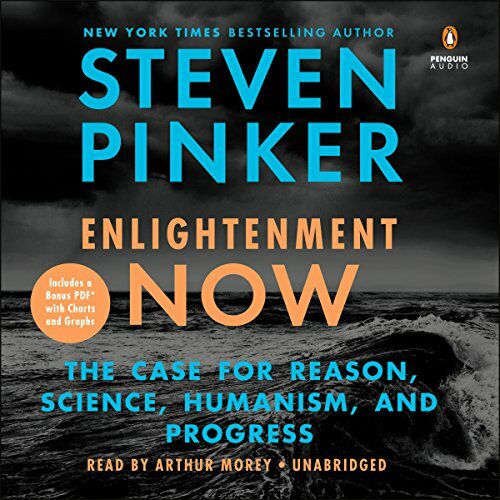 Pinker is best positioned among world-renowned intellectuals to update against all current challenges and repudiations the great tradition of european englightenment, which is not , as some would have it, a euro-centric quirk, but the only sound, time-proven and universal basis for an open liberal society. Many self-help/positive thinking books advise people to "count their blessings" every day, but this book should be the ultimate blessing-provider : remind every day that you live in a time where the risks of suffering or dying a violent death are lower than they have ever been, thanks, ultimately, to science and reason. And it should make deservedly proud all those who have contributed, through the patient incremental collective efforts of science and engineering, to this secular achievement. 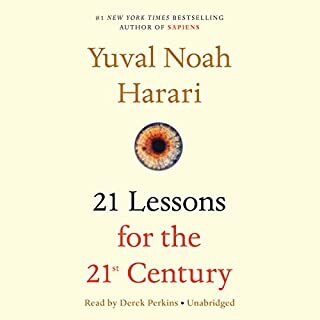 I am not through this book yet, but 4 hour into the book today (2-13-2018) this book is every bit as good as Better Angels, which is my favorite non-fiction out of hundreds I have listened to on Audible. Authur Murray is the perfect narrator for this book as he was for Better Angels. This book will make you feel better about our world with solid facts provided to lay a foundation for this optimism. 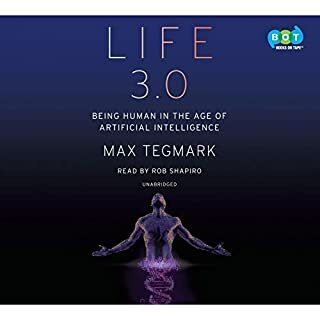 Difficult to follow graphs and data in an audiobook. Narration is also a bit too monotone. This book follows pleasantly on “The Better Angels of Out Nature” in its positive outlook of the enlightenment and the development of modern society through reason and science. 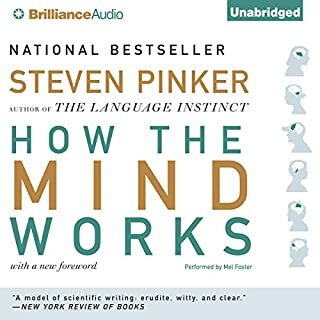 As always Steven Pinker is an engaging writer and one can’t but admire the style and confidence of his narrative, which he supports with figures and facts. It is outside of his field of Cognitive Psychology, Neuroscience, and linguistics, and in some cases his lack of in depth knowledge in other fields such as technology can be detected. Also as expected their is a slight bias to his narrative but all within reason, excuse the pun. Generally it is a more realistic and positive outlook into a future that too many are presenting as dystopian. 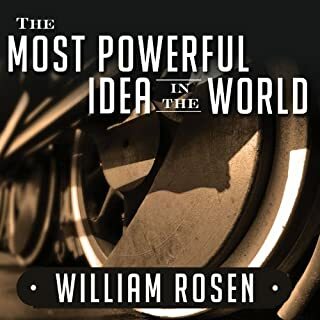 While there are dangers of the accelerating advancements made, which the author sometimes eludes to, all in all, a book worth reading as with all of his books. 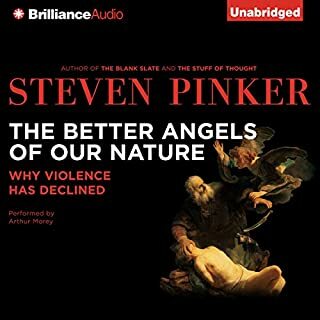 Recommended to those who are Steven Pinker fans, as he does not disappoint, as well as the many that watch too much bad on news on TV. A well-thought out and constructed argument for applying reason to today’s problems supported by empirical evidence usually presented over a longer time horizon than the media’s fascination with aberrations to overall trends and linear forecasting. If a magical genie were to appear to me and give me three wishes, one of them would certainly be that all human beings would read and understand the message of this book. 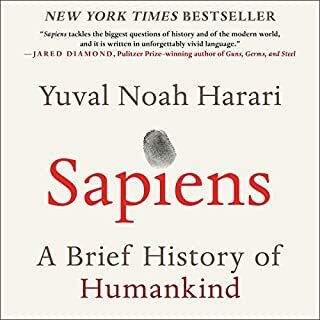 Told in a way that is objective, entertaining, educational and full of “aha” moments, this book and its author are a balm and an antidote for the rash of apathy, magical thinking, and tribalism that seem to abound today. Clair, précis, d'une importance et pertinence difficiles à surestimer, ce convaincant requiem intellectuel pour le progrès, la science, l'humanisme et la raison défait mythes et idées reçues et chasse le pessimisme, le nihilisme et la morosité. Bravo! Bravissimo!! This is an okay read/listen, but it’s one of the least audible Audible books I have encountered. I suppose it’s possible my hearing isn’t what it used to be, but so far I haven’t noticed other readings being quite so muted. Please leave the volume-lowering to the listener and crank that mutha up! Thanks!